Quick OOTD today! Hope you like it! Poppy Apparel is an online boutique that I've discovered! They have really cute stuff guys. I especially love their selection of jewelry and graphic tees. If you haven't checked them out yet, give them a visit! This floral maxi skirt is from there and it came in a matching two-piece set. 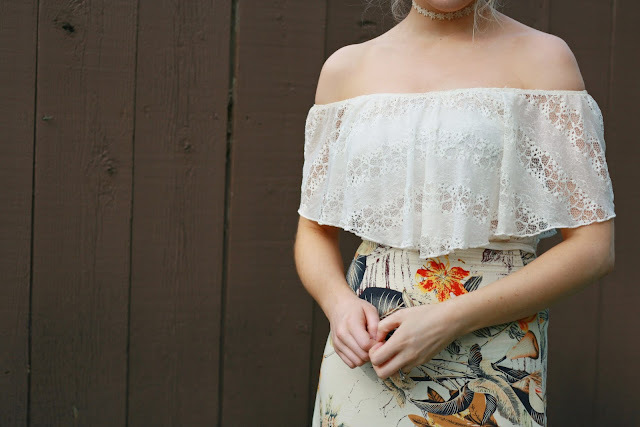 It has a matching floral print crop top that is also really pretty, but I wanted to pair this off-the-shoulder top with it! I love matching separates because you can make so many different outfits with them. The matching sets are great purchases to make because of their versatility. This look is darling! I especially love your dainty flower choker!